In October 2013 A RESNET Policy Proposal titled “Introducing Transparency and Rationality into the Home Buying Process” cites that the lack of information available to consumers regarding the energy performance of homes is a significant issue for American homebuyers as well as the U.S. economic strength and national energy security. To address this issue, RESNET supports a mandatory requirement for Home Energy Rating System (HERS) Index Scores for all homes, new and existing, financed through a federal mortgage program, such as Fannie Mae, Freddie Mac, the Federal Housing Administration (FHA) or the Department of Veterans Affairs (VA). RESNET believes this will lead to greater transparency in the marketplace and allow homebuyers and mortgage financiers to include energy efficiency and have a better understanding of the energy performance of the home. A second, equally important problem affecting American homeowners are current mortgage underwriting practices that ignore energy (and cost) saving features in homes. The new calculation will account for a home’s expected energy cost savings when calculating the value and affordability of energy efficient homes. The adoption of a new formula will bring rationality and greater flexibility as to how mortgages are calculated in the U.S. Housing market, Other sectors such as automobile and home appliance manufacturers, for example, understand that consumers are increasingly engaged in comparison-shopping for products based on their efficiency. Whether it is MPG (miles-per-gallon) stickers for cars or Energy Guide labels for appliances, these industries have responded to consumer demand for transparency. Requiring a HERS Index Score for all homes financed through federal mortgage programs like Fannie Mae, Freddie Mac, FHA and VA will create real transparency for homebuyers. 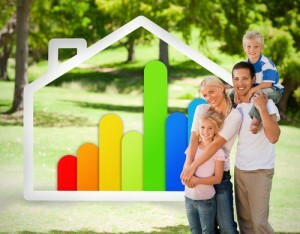 Currently over 250,000 homes are rated and issued a HERS Index Score each year. Over 1.3 million homes in the nation have been issued a HERS Index Score. Already communities in Arkansas, Colorado, Kansas, Massachusetts and New York require that all new homes are energy rated and post the HERS Index Score at the time of listing. Over 150 state and local governments across the United States from Fayetteville, Arkansas to Boston, Massachusetts are making HERS Index Scores a performance compliance option as a part of their building energy code. In addition Multiple Listing Services (MLS) in Colorado. Illinois, Minnesota, Nebraska, Oklahoma and Washington includes a HERS Index Score in their listings. The MLS is a critical tool is transparency in the market place. Realtors use it to identify homes for prospective buyers and appraisers in identifying comparable properties for the appraisal. Bringing transparency and rationality to the housing market is long overdue. Inflexible mortgage underwriting and appraisal procedures place obstacles in the paths of homeowners who want to invest in cost-saving energy efficient improvements. In addition, while consumers across the United States are able to make informed buying choices for appliances and cars based on energy performance, it is far more difficult for them to do so when purchasing a home. Providence Homes is Jacksonville, Florida’s hometown builder. As one of the area’s largest locally owned home builders, we are committed to building beautifully designed, 100% Energy Star certified homes at an affordable price. No matter which neighborhood you choose in Clay, Duval, or St. Johns County, Providence Homes has been a name families can trust as a Jacksonville new home builder for more than 20 years.